“There was the cycle of the mineral, the rock. There was the cycle of the plant. And now we are in the cycle of the animal coming to the end of that and beginning the cycle of the human being. When we get into the cycle of the human being, the highest and greatest powers that we have will be released to us. They will be released from that light or soul that we carry to the mind. But right now we’re coming to the end of the animal cycle and we have investigated ourselves and learned what it is to be like an animal on this earth. To the West the Great Spirit gave the black race of people the Guardianship of the water. They were to learn the teachings of the water which is the chief of the elements, being the most humble and the most powerful. When I went to the University of Washington and I learned that it was a black man who discovered blood plasma, it didn’t surprise me because blood is water and the elders already told me the black people would bring the teachings of the water. To the North the Great Spirit gave the white race of people the Guardianship of the fire. If you look at the center of many of the things they do you will find the fire. They say a light bulb is the white man’s fire. If you look at the center of a car you will find a spark. If you look at the center of the airplane and the train you will find the fire. The fire consumes, and also moves. This is why it was the white brothers and sisters who began to move upon the face of the earth and reunite us as a human family. And so a long time passed, and the Great Spirit gave each of the four races stone tablets. Ours are kept at the Hopi Reservation in Arizona at Four Corners Area on Third Mesa. I talked to people from the black race and their stone tablets are at the foot of Mount Kenya. They are kept by the Kikuyu Tribe. I once had the honour of presenting a sacred pipe at the Kikuyu Tribe carved from the red pipe stone of Mount Kenya. I was at an Indian spiritual gathering about 15 years ago. A medicine man from South Dakota put a beaded medicine wheel in the middle of the gathering. It had the four colors from the four directions; He asked the people, “Where is this from?” They said, “Probably Montana, or South Dakota, maybe Saskatchewan.” He said, “This is from Kenya, Africa” It was beaded just like ours, with the same colors. So tribes began to send people to the mountains to have visions to try to figure out how they could survive. At that time there were 100,000 cities in the Mississippi Valley alone, called the mound civilization: cities built on great mounds. Those mounds are still there. If you ever go out to Ohio or the Mississippi Valley, they’re tourist attractions now. There was 100,000 cities of Native people and they were wondering how they could survive. They began to try to learn to live off the land because they knew a hard time was going to come. They began to send people to have visions to see how we could survive this time. People came on the east coast and they went across this land to the west and they were told in the prophecies that we should try to remind all the people that would come here of the sacredness of all things. If we could do that, then there would be peace on earth. But if we did not do that, if we had not come together as a human family, the Great Spirit would grab the earth with his hand and shake it. And so, if you read the treaty negotiations from Red Jacket of the Six Nations on the east coast of this land clear to Chief Joseph and Chief Seattle on the west coast of this land, they all said the same thing. Chief Joseph said, “I accord you the right, and I hope you accord me the right, to live in this land.” Always we were trying to live together. But instead of living together, you all know there was separation, there was segregation. They separated the races: they separated the Indians, and they separated the blacks. In the state of Washington it was against the law for an Asian to marry a white person up until not too long ago. There was separation. At that time the United States Supreme Court had held that a reservation is a separate and semi-sovereign nation, not a part of the United States but protected by it. This became a concern because people didn’t want the reservations to become more and more separate. They didn’t want them to be considered nations. So they did not write back and the Native people were left out of the League of Nations, so that circle was incomplete. In the League of Nations circle there was a southern door, the yellow people; there was a western door, the black people; there was a northern door, the white people; but the eastern door was not attended. The elders knew that peace would not come on the earth until the circle of humanity is complete, until all the four colors sat in the circle and shared their teachings, and then peace would come on earth. The worst misuse of the Guardianship of the fire is called the “gourd of ashes”. They said the gourd of ashes will fall from the air. It will make the people like blades of grass in the prairie fire and things will not grow for many seasons. I saw on television not too long ago that they were talking about the atomic bomb, the gourd of ashes. They said it was the best-kept secret in the history of the United States. The elders wanted to speak about it in 1920. They said, and I know many of you are from tribes that also have this prophecy, “You’re going to see a time when the eagle will fly its highest in the night and it will land upon the moon.” Some tribes say the eagle will circle the moon. Some tribes say the eagle will fly its highest in the night. “And at that time,” they say, “Many of the Native people will be sleeping,” which symbolically means they have lost their teachings. There are some tribes that say it will be as if they are frozen: they’ve been through the long winter. But they say, “When the eagle flies its highest in the night, that will be the first light of a new day. That will be the first thawing of spring.” Of course, at the first light of a new day, if you’ve stayed up all night, you notice it’s really dark. And the first light, you want to see it, but you can’t. It sneaks up on you. You want to see it change but its dark and then pretty soon it’s getting light before you know it. We’re at that time now. The Eagle has landed on the moon, 1969. When that spaceship landed they sent back the message, “The Eagle has landed.” Traditionally, Native people from clear up in the Inuit region, they have shared with us this prophecy, clear down to the Quechuas in South America. They shared with us that they have this prophecy. When they heard those first words, “The Eagle has landed,” they knew that was the start of a new time and a new power for Native people. There was absolutely nothing strong before us now. We may do anything we wish. But we’re in that time now. We’re between the first light of a new day and the sunrise. The sunrise is about to come and when it comes up everyone is going to see it. But you know how it is in the village there’s a few people that get up early, and there are some that sleep until noon. They said when that Eagle lands on the moon, the powers will begin to come back to us. As an alcoholic person, I feel that one of our greatest diseases is alcoholism. 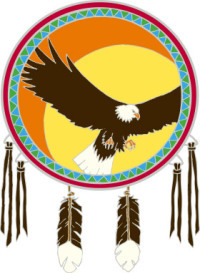 Within seven days of the time of the Eagle landing on the moon, the first Native alcoholism program was started on an Apache reservation in Arizona. The Elders said at this time you’re going to see that things will speed up, that people on the earth will move faster and faster. Grandchildren will not have time for grandparents. Parents will not have time for children. It will seem like time is going faster and faster. The Elders advised us that as things speed up, you yourself should slow down. The faster things go, the slower you go. That is because there’s going to come a time when the earth is going to be shaken a third time. The Great Spirit has been shaking the earth two times: the First and Second World Wars to remind us that we are One Human Family, to remind us that we should have greeted each other as brothers and sisters. We had a chance after each shaking to come together in a circle that would have brought peace on earth, but we missed that. Tonight they were talking on the news about the sign for the Third Shaking of the Earth. They said they’re going to build what the elders called the “House in the Sky”. In the 1950s they talked about this: they will build a house and throw it in the sky. When you see people living in the sky on a permanent basis, you will know the Great Spirit is about to grab the earth, this time not with one hand, but with both hands. Many of you of Indigenous background may have heard “the spirits will warn you twice, but the third time you stand alone.” We’ve had two warnings, the first two World Wars, but now we stand alone in the third one… There will be no-one protected. When this house is in the sky, the Great Spirit is going to shake the Earth a third time and whoever dropped that gourd of ashes, upon them it is going to drop. They say at that time there will be villages in this land so great that when you stand in the villages you will not be able to see out, and in the prophecies these are called “villages of stone”, or “prairies of stone”. And they said the stone will grow up from the ground and you will not be able to see beyond the village. At the center of each and every one of these villages will be Native people, and they will walk as “hollow” shells upon a “prairie of stone”. They said “hollow shells” which means they will have lost any of their traditional understandings; they will be empty within. They said after the Eagle lands on the moon some of these people will begin to leave these “prairies of stone” and come home and take up some of the old ways and begin to make themselves reborn, because it’s a new day. But many will not. And they said there’s going to come a time when in the morning the sun is going to rise and this village of stone will be there, and in the evening there would just be steam coming from the ground. They will be as steam. And in the center of many of those villages of stone when they turn to steam, the Native people will turn to steam also because they never woke up and left the village. And this used to bother me when I was a young man. I used to ask the elders, “Isn’t there anything we can do?” And they said, well, it’s just that way that if a person does not have the spiritual eyes to see, it’s very hard to show them. Or if they don’t have the ears to hear, it’s very hard to speak with them. We wish that we could go get them all but we can’t. It’s just that some are not going to wake up. But some will wake up. And so they say there’s going to be the “third shaking of the earth.” It’s not going to be a good thing to see, but we will survive it. We will survive it. And when we survive it, then there’s going to be another attempt to make a circle of the human beings on the earth. And this time the Native people will not have to petition to join but will be invited to enter the circle because they say the attitude towards us will have changed by then, and people will let us into the circle and all the four colors of the four directions will share their wisdom, and there will be a peace on earth. This is coming close. A lot of times when I share this message of the prophecies, people say, “Can’t we change it? Could we stop it?” The answer is yes. The prophecies are always “either/or”. We could have come together way back there in 1565, and we could have had a great civilization, but we didn’t. Always along the path of these prophecies, we could have come together. We still could. If we could stop the racial and religious disharmony, we would not have to go through this third shaking. The elders say the chance of that is pretty slim. It seems to me like it’s pretty slim, too. But they say what we can do is we can “cushion” it. The word we use is “cushion”. We can cushion it so it won’t be quite as bad. How do we do this? We do this by sharing those Sacred Teachings that will reunite us.